Comfort & Style : Best Fashionably Comfortable Hoodies that you have wore till now, Fabric is so soft over the skin. High Fashion rich culture look will get just teaming up with washed jeans. you can use this sweatshirt for jogging. 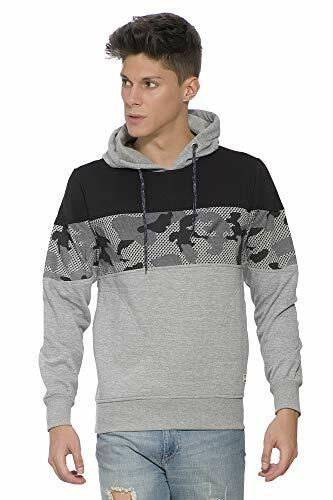 Sleeve Type: Full Sleeve; Pockets : Two Side Pockets which is enough of cover your palm, when you feel cold; Style: Fashionable round neck Hoodie. Perfect for Trending Stylish Look for Company Outs as well. Simple and sophisticated look it will bring on. Perfect for Winters, Night Highways long drive. Note: Check the Size chart in the product images for perfect fit. Quality: All garments are subjected to the following tests Fabric dimensional stability test and quality inspection for colours and wash fastness. To maintain the Color please dry in shades. Usual Machine wash or Regular wash is preferable.